Lost message on iPhone after updating to iOS 11? Don’t Worry! Try the method in this post to get back them from your iPhone. 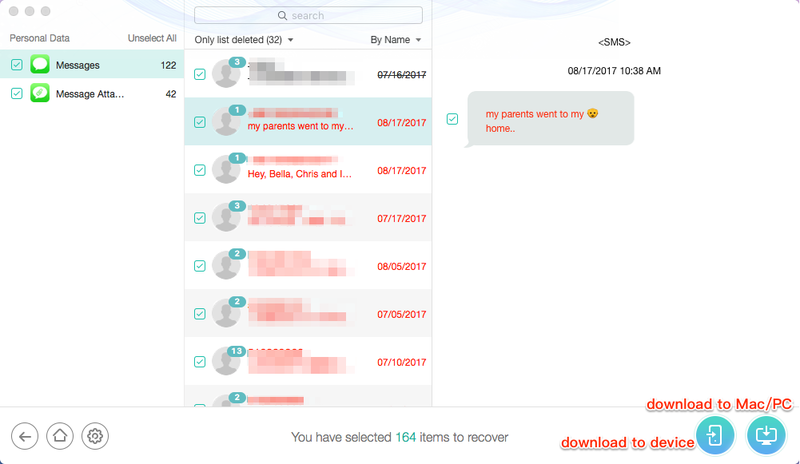 Download PhoneRescue for iOS to get back your lost SMS messages from iPhone or iPhone backup – Only 3 simple steps & support all iPhone models. Apple recently released iOS 11 to fix the problems of iOS 10 and make iOS run more stable and safe. However, just like the previous iOS 10.3.3/10.3.2 update, this iOS update also has some problems, such as can’t sync iPhone music and iPhone messages disappeared. We have posted a article to solve iTunes sync problem, and now we talk about how to get back lost messages on iPhone - If we lost text messages or iMessages on our iPhone after iOS 11 update, what can we do to get them back? 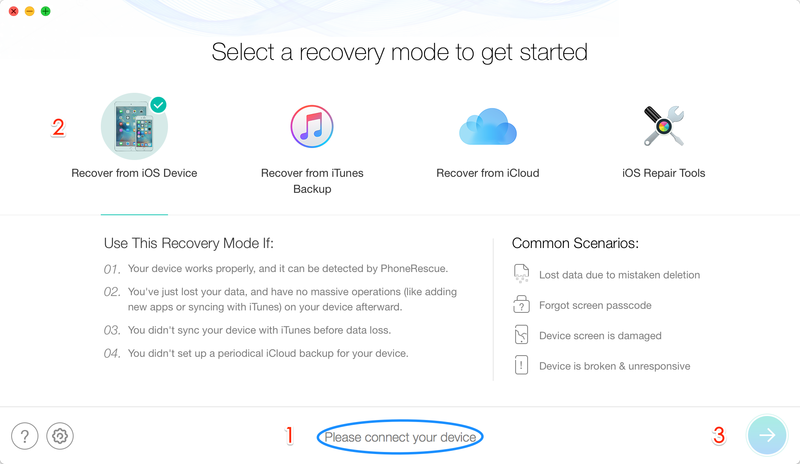 The traditional ways to recover your iPhone is using iTunes and iCloud – two ways Apple officially provides for you to backup and restore your iOS devices. However, the restoring will erase all of your iPhone data and it request that you have one iPhone backup that created before you lost the messages. Therefore, we provide one simple application PhoneRescue for iOS for you to recover lost message on iPhone, and it is also compatible with other iOS devices, such as iPod touch, iPad Air/Mini. With this tool, you can scan your lost data on iPhone and save them as HTML/TXT/PDF to computer. Additionally, you can also use it to extract text messages from iPhone backup; no matter it is one iTunes backup or iCloud backup. 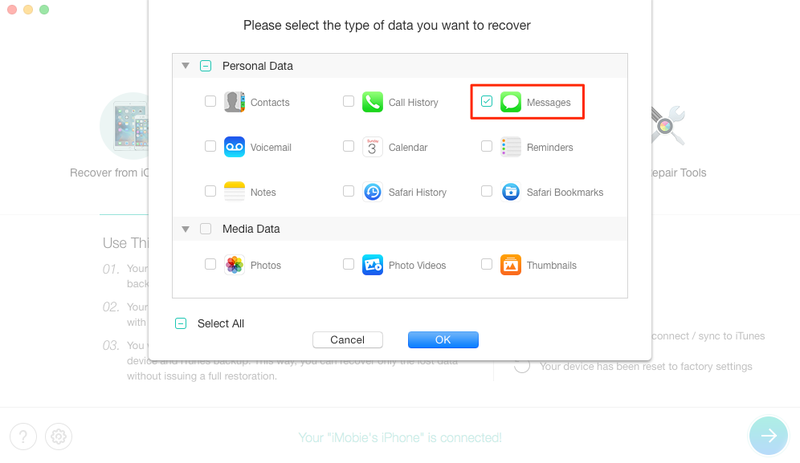 Now let's check the steps about how to use it to recover iPhone lost messages and messages attachments. Requirements: your iPhone, one USB cable, one computer, and PhoneRescue for iOS. Note that PhoneRescue is a data recovery for both iOS and Android, so please download the version you need. After downloading PhoneRescue for iOS and installing it on computer, you can easily try 3 methods to get back text messages on your iPhone. Step 2. By default, all categories will be checked. Please uncheck Select All option and only tick Messages > Click on OK to scan lost messages on your iPhone. Step 3. Preview and select the messages you want to recover > Click To Device button to put selected messages back to your iPhone directly, or you can click To Computer button to store them on your computer. If the lost text messages were overwritten by some new data your iPhone created, you can't get them back from your iPhone directly. So before updating to a new iOS operating system, you'd better backup the contents on your iOS device.